More information has been posted on the Velvet Octopus page for the upcoming film, due for release Christmas 2009. The director of the film will be Mark Dippe (Garfield’s Fun Fest, The Reef, Garfield Gets Real) and it is being written by Daniel and Steven Altiere (Dr. Dolittle, Scooby Doo 3, Garfield’s Fun Fest). There is a synopsis of the story which will be very familiar to you if you've played The Legend of Spyro: A New Beginning, it's essentially the same but with some minor changes. This is intended to be the first in a franchise of Spyro films. After ticking down for the past few days the countdown on Spyro's Lair has reached zero. And with impeccable timing nothing happened. 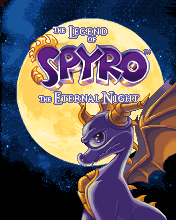 UPDATE: Several hours later and here it is: the minisite for The Legend of Spyro: Dawn of the Dragon. Developed by newcomers to the series, Etranges Libellules and Tantalus Interactive (DS version), the game appears to be taking a much more realistic look after the previous two Legend of Spyro games. The game is due to appear on Xbox 360, PlayStation 3, Wii, PlayStation 2 and Nintendo DS this October. The minisite for Dawn of the Dragon is up and running with the official Press Release, five screenshots and five pieces of Concept Art. You can also see those images in our gallery. The first 18 images from The Legend of Spyro: Dawn of the Dragon have appeared on IGN. As they're from the Xbox 360 version, they're quite big. 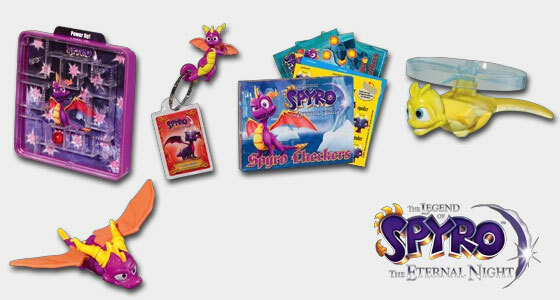 They also confirm all the information from ToTheGame, right down to the typo in Spyro's name. See also Kotaku for DS screens. Thanks go to Spyro Technics for spotting them on IGN. Confirmation of the information from tothegame has appeared in Sierra's own news section. Thanks go to Twilight for the find. Recently SpyroWorld spotted that a website called tothegame had posted pages for a game called The Legend of Spyro: Dawn of the Dragon. tothegame at the same time had pages for a Crash Bandicoot game entitled Crash Bandicoot: Mind over Mutant, this name has turned out to be accurate... so could the Spyro name (and info) be correct too? In the culmination of the trilogy, players find Sypro teaming up with an unlikely ally - Cynder, his former enemy, to face his most challenging mission to date. As the Dark Master's (voiced by Mark Hamill) evil envelopes the world like a plague, Spyro must fulfill his destiny and unlock the true power of the purple dragon within him to stop the Dark Master in his tracks. Two elements never before seen in the Spyro universe: fly at any time and drop-in/drop-out co-op, with Cynder. Both characters can complete the game separately as well. 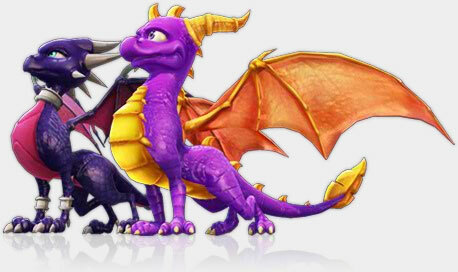 Cynder being introduced as a strong, female lead alongside Spyro, girl gamers will have something to get excited about! Fun combat gameplay with new elemental attack moves/combos, enemies, environments, etc. This is the third and final installment of an epic trilogy, giving players a more mature character design and story line since the previous title; The Eternal Night. Spyro makes his debut on the PS3! This new venture for the purple dragon onto the next gen console will attract new players who may have not been able to experience the Spyro series previously. The information posted for both games was quickly removed but Mind over Mutant has today appeared at Crash Village with the same story. In case you were still a little sceptical, today Nintendo announced a list of games due out this year, a list including "Spyro (tentative title) (Vivendi Games) October 2008" for both Wii and DS. For those Crash Bandicoot fans out there they also list a Crash game for them both as well. A mysterious countdown has appeared on the splash page to Spyro's Lair. It appears to be counting down to the 28th of April (12 pm GMT). As the image accompanying the countdown is the after credits image from The Legend of Spyro: The Eternal Night, could this be a countdown until they officially announce the third part of the Legend of Spyro trilogy? Thanks go to Twilight for spotting it. It seems Spyro might be about to become a movie star. Spyro the Dragon could soon breathe some fire on the bigscreen: The Animation Picture Co. has optioned the rights to turn the purple star of Sierra Entertainment and Vivendi Game's vidgame franchise into a toon. 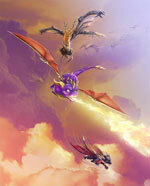 The film will apparently be based around the Legend of Spyro games. With the release of The Legend of Spyro: The Eternal Night last week, the first few reviews of the game have started to appear. IGN didn't much like the Nintendo DS version of the game, giving it a score of five and a half out of ten (they also have some videos of the game to help you prejudge it yourself). The Legend of Spyro: The Eternal Night is still far better than the first Spyro outing that appeared on the Nintendo DS, but it fails to keep the momentum going after last year's decent title. Meanwhile Mobile Game Faqs give the mobile version of the game 76% (7% lower than their score for A New Beginning). This is a well put together game that's fun to play. 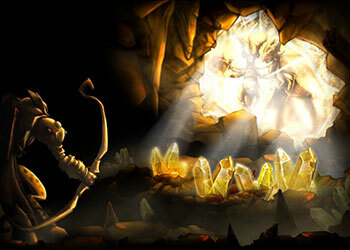 The levels do also have some variety between being gem collecting levels, boss levels and flying levels. And magazines Play and Game Informer have apparently given the console version 8.5 and 6.25 respectively. On the interview side of things, IGN have a lengthy (on the side of the interviewee) interview with Don Meadows of Krome Studios. I am most proud that we have boss characters that are true boss characters. Both we and Sierra wanted to recapture what it was like to have the coin-munching bosses from older arcade games. And finally, DS Fanboy also have an interview, theirs is with Amaze Entertainment's Sean Epperson about the GBA version. It's designed in such a way that a player who is a novice to action games can do cool looking moves, while a player more familiar with action games would find many more layers to the depth of the combat system. Thanks go to Neal for the magazine scores and finding the mobile review, and to Sean for pimping his own interview. Wendy's are to start promoting The Legend of Spyro: The Eternal Night with their Kids' Meal from October through December. There are five toys to collect in all. 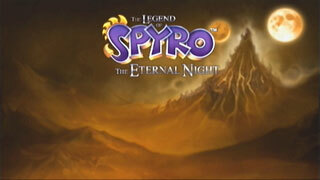 Gametrailers, have a few new videos for The Legend of Spyro: The Eternal Night. One is a trailer, the second more of a gameplay montage, a third just straight gameplay and the fourth an interview with Chris Wilson, Creative Director of the game. 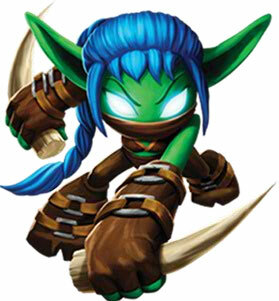 Sparx, with his new voice by Billy West, appears in the trailer and third video for those curious as to what he's going to sound like. IGN have also posted a pair of gameplay videos for the Wii version of The Legend of Spyro: The Eternal Night showing Spyro jumping around what appears to be this game's training area. GameSpot too have a host of new videos, three for the Wii, and three for the PS2. They've also got some new screenshots for the Wii, PS2, DS and GBA versions. Thanks go to Lil-Cynder for finding the IGN videos and spyrotrailers in the comments below for the Gametrailers links.